The need for electrical enclosures that require both RF shielding and weatherproof features are a large market for aluminum die castings. 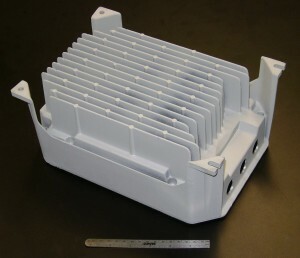 A die casting can be designed to offer many internal features such as stand offs, flat surfaces for heat sink transfer, and molded in fins. Value is created through these components, which transfer heat from circuit boards inside the enclosure to the ambient area outside. An important feature of die cast enclosures is the ability to plan for harsh outdoor conditions. Casting in gasket grooves or RF gaskets will allow you to weather seal the product if required in the final design. Die cast enclosures can mold different features for a hinged arrangement so that the end user of the product can easily access the interior of the enclosure for service. These features are also proven to be beneficial when aiming to reduce costs. Many times a company starts with a machined or sheet metal enclosure design to start initial samples or pilot lot production to determine the acceptance of the product in the market place. However if the product has the potential for higher volumes of production it makes sense to review the feasibility of the die cast process as an option to other processes. If the cost/benefit of die casting is calculated and accepted then the design process should begin early in the stage of product development which will help reduce costs overall on the project. If you are interested in a design review for application to aluminum die casting from either a concept or an existing process, please click here to request a quote.